Years ago, we started employing a five- to ten-minute rhythmical ice breaker – using just hands – at the beginning of our drumming and music-based teambuilding activities. The opening of a session is a critical time for both the head facilitator in charge and all the participants, who have just walked in to this very new musical environment. Using this mini ice breaker, our facilitators have been able to quickly assess a group’s attitude and their level of musical skill , as well as beginning the subtle process of participants learning from body language and certain musical commands. Most of all, our mini ice breaker has got participants laughing, making them quickly relax. This ice breaker became so effective that, over the years, some of our repeat clients enquired about the possibility of us just delivering this ten-minute activity in isolation. It was deemed ideal for situations where there is simply not enough time in the conference or meeting agenda to hold a longer activity. So, the standalone activity, which we named Clap Happy, was born! 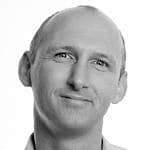 Clap Happy has now become a much sought activity, and is a fantastic ice breaker or energiser. I have recently returned from facilitating a week’s road show of dinner events, where Clap Happy provided a great pre-dinner surprise. Clap Happy lasts up to thirty minutes in duration. The objective of Clap Happy is to create an amazing clapping percussion orchestra and, along the way, we integrate as much audience participation as time allows. We first ask everyone in the room to look under their seats, rip open the bags they find there, and put on their own vibrant pair of rubber gloves! 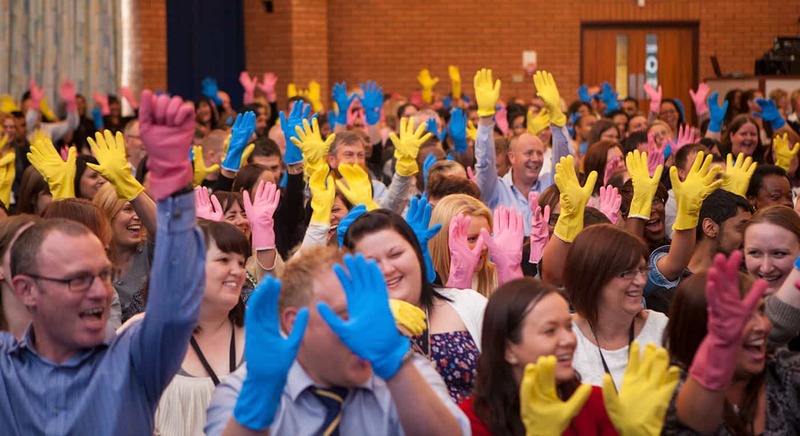 You can imagine the hilarity of seeing everyone in rubber gloves but it does instantly bring colour to the room, and the use of colour has major significance. Each separate colour has its own unique rhythmic part to play. Each of these individual rhythmic strands is layered on top of the others, building towards an incredible finale group performance. With practically no set up or clearing away required, it’s perfect for ‘tight’ agendas, where the available time is short. It is always a lot of fun. It dramatically changes the look, feel and energy of the room, to ensure that the following session benefits from a fully-awake and energised audience! Also, participants are left with a very special conference reminder as they get to keep their rubber gloves. For more information, view our Clap Happy page or Contact Us now.